Penmon at the eastern end of the Menai Strait of Angelsy is small, compact but has a great deal of history. As well as the Trwyn Du Lighthouse ﻿there is an ancient well linked to one of Welsh Saints dating back to the 6th Century. St. Seiriol’s Well survives near the Penmon Priory and may have its origins going back to the monastery’s earliest period or even earlier. The Bronze and Iron Age peoples often revered water edges and places. The number of site that have revealed votive offerings in the form of gold, valuables and broken weaponry is a testimony to the fact that water was an important aspect of their lives. So it makes sense of the early church to build on this reverence and subsume it into their teachings and places of worship. The concept of “adopt and adapt” is always a powerful means of change. The well was built by the monks of Penmon and was believed to have healing powers by some people visiting it. The earliest churches in Wales were connected with the cells or abodes of hermits. The foundations of of a circular building next to the well may be St Seiriol’s, but it would be very difficult to prove this now. 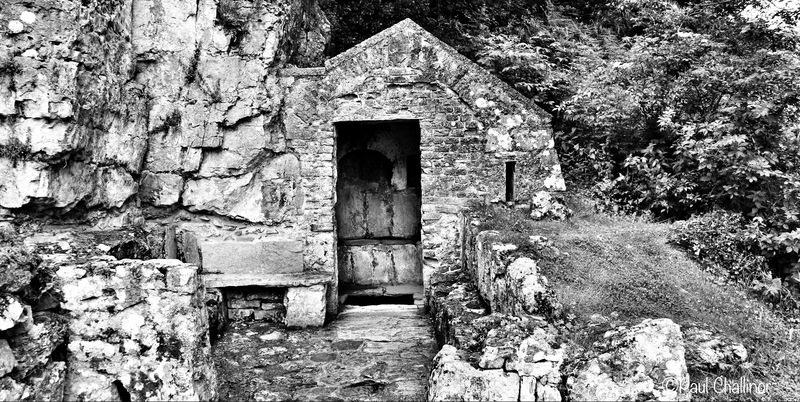 Attached to the cell on level ground in front of the well was a small primitive building in which the surrounding inhabitants assembled for the purpose of prayer, but again the original date is unknowable. If only we had a time machine! According to legend, Seiriol regularly used to meet St Cybi of Holyhead at Clorach Well near Llannerch-y-medd, 17 miles away. Seiriol travelling with his back to the sun in the morning and returning with his face to the east in the afternoon, became known as Seiriol the Pale, the other, Cybi the Tanned. Whether this is true is open to debate, but it could equally be a play on a parable between light and dark. St Seiriol was buried on nearby Puffin Island. The entrance to the well. The Holy Well is a spring emerging from a cliff behind the church. It is reached by a path on the left just beyond the car park, which skirts the monastic fish pond. The crystal clear spring is surrounded by a slab floor with stone benches around the sides. However, on the day that Aunty and I visited the well was dry, someone must have left the plug out. The waters were thought to have healing powers and were visited by the sick and infirm in the hope of a cure. Although it is the source of water for the monastery, the structures are relatively modern. The roofed inner chamber around the pool is of brick and dates from 1710. The lower courses and lower antechamber with seats on either side may be somewhat earlier, but no medieval finds were made during recent excavations. The so-called ‘cell’ beneath the cliff on the left is of uncertain date and purpose. It has been suggested that these may be the remains of the original cell or church. If so, this would make it the oldest remaining Christian building in Wales. The remains of a circular structure are clearly vidible to the left of the well. Could this really be St Seiriol’s cell? A lesser known legend concerns Seiriol’s brothers, kings of nearby Rhos and Llŷn. Apparently they decided that the monk’s humble cell was far too lowly for a royal, so they founded a monastery nearby and made Seiriol the first Abbot of Penmon Priory. 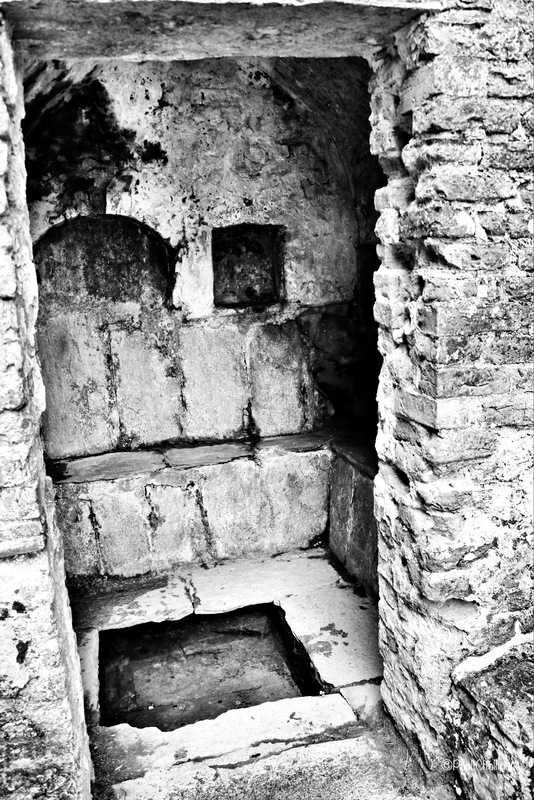 Inside the well, showing the water basin and the seating around the walls.